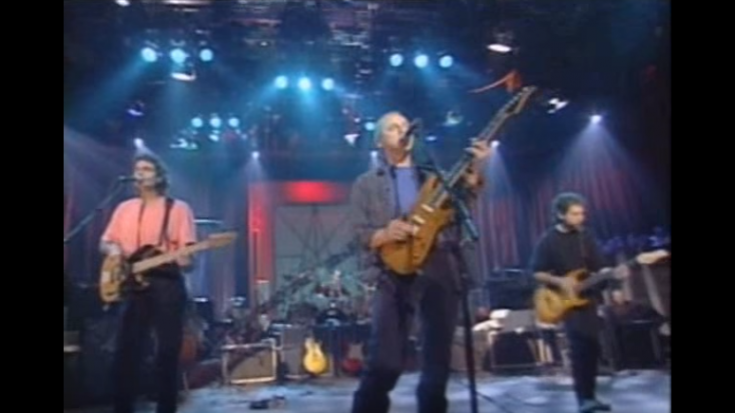 Dire Straits’ BEST “Sultans Of Swing” Performance Defines Real Rock And Roll! Written about some buddies that hit up a club after work, Dire Straits’ “Sultans Of Swing” was the band’s first single and their greatest classic, hitting #4 on the Billboard Charts in 1979. As they shine up on the stage, lead singer, Mark Knopfler, gives the performance of a lifetime on their “Alchemy: Dire Straits Live” DVD released in 1984. Inspired by a crappy band he saw at a club one night named the Sultans Of Swing, comforting lost drunks with mediocre music, Mark was immediately taken by the title and decided to create a story to put to it. Interesting Fact: The “Guitar George” and “Harry” who are mentioned in the lyrics are George Young and Harry Vander, who were guitarists in the band The Easybeats. George Young is Angus Young’s older brother and Harry and George helped get AC/DC recorded. Any time we hear Mark’s iconic solo we get chills, which is why minute 4:52 and minute 7 are our absolute favorite! We’d also like to add that Dire Straits’ pianist Alan Clark is an absolute genius during this song, you’ll see what we mean when you hear the crowd’s chilling clapping on beat with the piano solo that will stop your heart. I think it’s safe to say that this could have worked on an instrumental piece only with the insane guitar solos, piano accents and killer beat, but we’re glad that Mark sang, of course! You may have seen plenty of performances of this song, however, this one is by far the best ever! Enjoy!